With creation of several bathroom suites in Milton Keynes and Bedford, Top Bathrooms helps realise your bathroom ideas in Bedford, Milton Keynes and nearby areas. A double vanity sink, often called his and her sink provides ample private space for couples and partners. It is a great way to maximize the sink area of the bathroom. With two sinks, couples will no longer need to wait for the other to finish using the sink. This saves them valuable time for prepping up during the day. A double vanity sink also provides more storage space for each person’s toiletries and bathroom accessories, especially to the ladies. With better storage, it will be easier to organize each other’s things. There are variations to double vanity sinks. 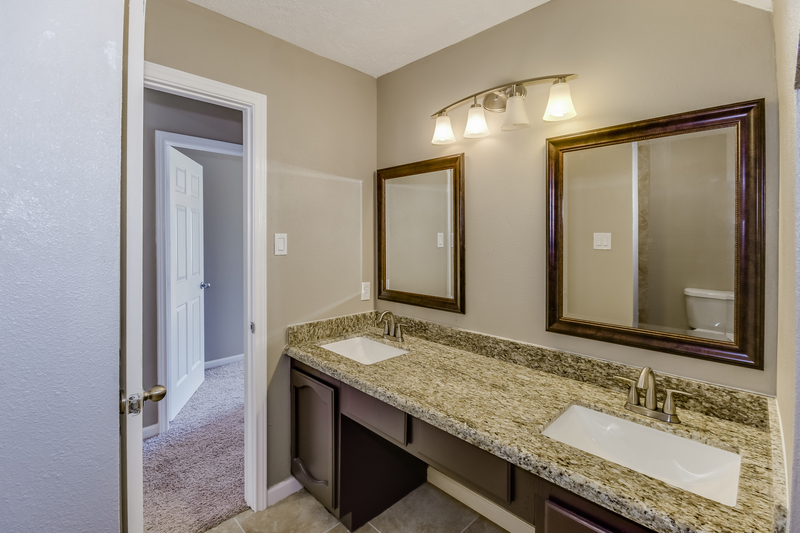 You can either purchase a pre-made double vanity or have it custom-made. You can play with different materials (such as wood, marble, granite, and crystal) to get the desired look that will complement the overall design of your bathroom. Here are some his and hers sink ideas you can get inspiration from. Combine elegance and modern design in your double vanity with oak wood cabinets and marble top. The floating design gives a sleek and clean look. The oak cabinets are made from veneer wood with a natural finish. The double vanity is equipped with acrylic sinks in glossy white. Two sets of cabinets and drawers are spacious enough for storing toiletries and towels. The honey onyx counter in this his and hers sink gives a dash of style on the sleek walnut cabinet. You can use marble or granite instead of onyx. Cabinets and drawers are made from high-quality wood. Each sink has accompanying three-door cabinets and two drawers at the centre that provide sufficient storage. The cabinets and drawers do not have handles to make a continuous design. Complete your bathroom accessories with a sophisticated free-floating double vanity. This design is the most common look for double vanities. The white oak wood gives a refined and luxurious look to the cabinet. You can opt for neutral colours should you find white too striking. The stone countertop provides a nice contrast with the soft-coloured oak. Each space has its own cabinets and drawers to store towels and other toiletries. Drawers have soft close doors. Sinks are rectangular with built-in faucets. It is fully functional and traditionally stylish. His and hers sinks can also be separate. This is useful if you are working with small bathrooms. 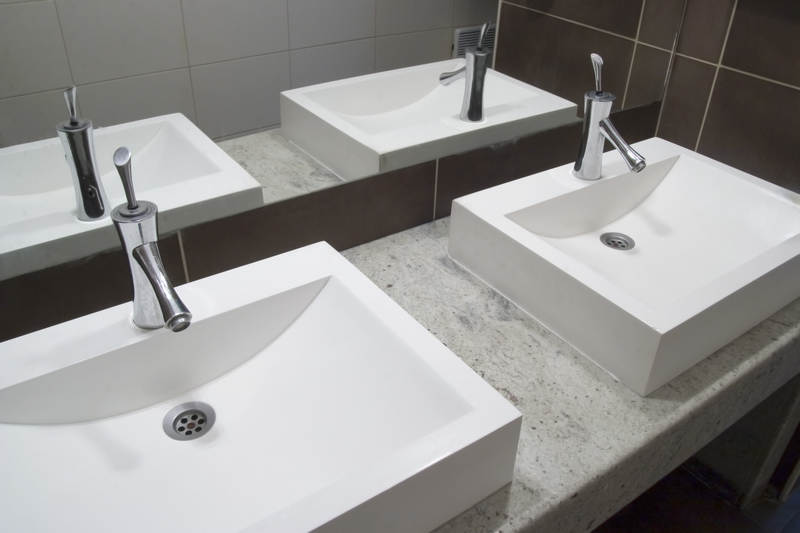 Two separate sinks can be placed in front of each other or side by side with a cabinet placed in between. A combination of hardwood cabinet with a charcoal grey finish, marble countertop, and ceramic sink gives a sleek and modern look. The top part has drawers for clean towels. The bottom of the cabinet is an open rack to place used towels and slippers. These separate sinks are simple and minimalistic. It consists of a granite countertop held by a steel framing. You can create variations with this design by changing the colour of the sink framing. It is perfect for small bathrooms since it is basically a sink with frames and legs. The lack of drawers prevents the sink from looking bulky and cluttered. It is best paired with an overhead cabinet for storing toiletries. A towel holder can be placed at the side of the countertop. Below the sink is an open space where you can place a basket or a bin to maximize its use.